Linda came recommended to me from a few other dance moms in our school. I ordered a custom made solo dress for my daughter for the first time from Linda, and we could not be any happier. Linda is a wonderful person and both myself and my daughter enjoyed working with Linda. Linda makes the whole process very easy and stress free. Linda took her time to explain everything to you, and listened to all of our ideas. The quality of the dress is amazing. The dress is everything we wanted and more. My daughter tells me the dress feels light and comfortable, not heavy at all to dance in. Linda loves what she does and cares about each piece of art she creates. Linda did an amazing job and there is nothing we would change. 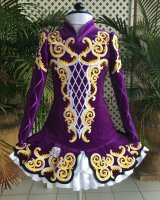 Kathryn Dunbar - February 2019"
"I had LinDesigns make two Irish Dance dresses for my girls, and alter several others. Linda spent countless hours in communication with me to ensure that all details of the dresses were just as envisioned. Her dresses are true quality as evidenced by her stitching and lining, and her prices are more than fair for the industry. I highly recommend anyone consider having a dress made by LinDesigns! Linda was so great to work with - she sent samples of the fabric and embroidery thread to make sure we were happy with it, and she double checked on the measurements to ensure we got the best possible fit. The attention to detail paid off - my daughter’s dress is stunning and fits like a glove! 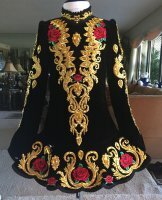 I found Linda’s site after doing an extensive search to find a unique and affordable option for my daughter’s next Irish Dance dress. We live in Los Angeles and finding a dress that would fit my daughter who is very tall for her age was not easy. So we decided to have one made. Linda was always very prompt in returning my emails and answering all my questions. Her direction on how to measure and ensure a good fit was very easy to follow. We sent a very reasonable deposit and a few weeks later she told us the dress was done! Linda and "My girls from Rondeau"
Linda was wonderful to work with! 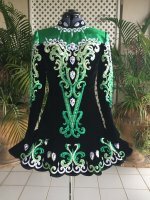 She worked with my daughter and I to create a custom dress incorporating embroidery designs to represent the part of Ireland my husband is from and worked with us until we found just the right colors for the dress. She is very thoughtful, attentive to detail, and professional. The dress arrived this afternoon and we couldn't be happier with the quality and workmanship. I highly recommend her. Thank you Linda!! We reached out to Linda looking for a dress for our daughter. She immediately asked what she was interested in and began incorporating my daughter’s “obsession” into the design. It was a smooth process from design to measurement and final product! We will definitely reach out again when we are ready for another one! Thank you! We could not be happier with our custom dress from LinDesigns. Linda was very easy to work with and she explained every step of the process and was very patient when deciding on a design and making modifications. Communication through the entire experience was prompt, professional, and informative. When we were unsure of how to measure, she agreed to skype with us and talked us through the process. Embroidered samples of the fabric were sent and when it was not quite right, she sent additional options and we were able to find exactly what we envisioned. "A very special dress for a very special girl"
When we received the dress, we were speechless! The workmanship puts the "major" dress designers to shame. Fully lined each piece, let out and down room, fully embroidered, and exactly as illustrated. When we had it altered our seamstress said it was the easiest dress to alter, she had ever worked on! We get complements at every feis and my daughter is to the moon and back. I highly recommend a LinDesigns dress, you will not be disappointed! Working with Linda on my daughter’s first bespoke dress was a terrific experience. Honestly, I was a bit intimidated going in, but Linda listened to what we wanted and worked with our ideas and budget. She communicated well, and we alway knew where the dress was in process. My daughter loves her dress and receives so many complements on it. We would be happy to work with Linda again. I'm absolutely thrilled with this dress. 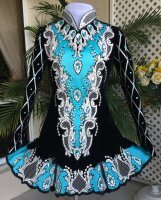 The colour and design is stunning and the dress is beautifully made. A big thank you for melting together several designs into one - a totally new look including a fabulous color gradient - excellent stichery ! 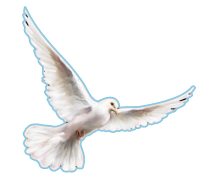 … always courteous and quick to respond. 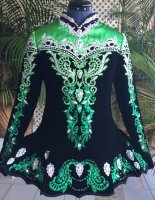 Non of my old dresses covered my scoliosis in this way including a continuous zipper - Linda has never seen me before and the last fitting some days before the feis was absolutly perfect, no changes had to be done. 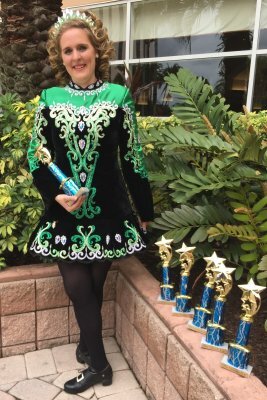 at the Orlando Feis 2018 with 7 of her 13 First Place Trophies! 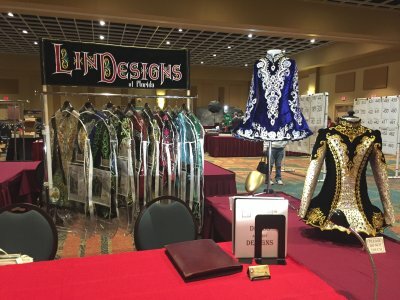 I had the pleasure of working with Linda at LinDesigns on two dresses last spring - one for my 9-year-old and one for my 11-year-old. Linda listened to our vision of what we had in mind for the dresses and was extremely informative regarding fabrics and other details. She provided us with sample illustrations based on our vision, from which each of my daughters was able to weigh in on final design and see their vision come to be. In both cases, Linda completed the dresses ahead of schedule and under budget! 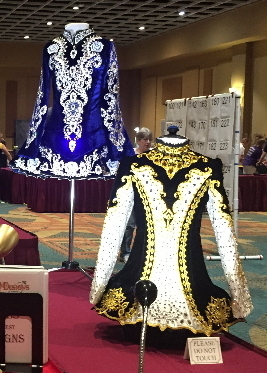 But what was most fulfilling about the process was watching my daughters put on a dress that they helped design, tailor-made for them, and stepping on stage to compete with new confidence. Even though my 11-year-old grew 4 inches in height after her dress was completed, Linda had included more than enough let out to accommodate that growth spurt. We have received numerous compliments on the dresses and I highly recommend LinDesigns! Linda Campbell is an excellent seamstress. She is creative, she gives advice on what looks best according to the body shape of the dancer, she gives a great variety of color choices and combinations, and she works according to schedule. She makes the dresses giving the clients the room to grow options so that the dress can be altered as the dancer grows. We were very happy with her work. Thank you, Linda!